Chrissy Brajcic was hospitalised in October this year suffering from sepsis. A CAMPAIGNER WHO had worked to highlight complications suffered by women who underwent vaginal mesh operations has died. 42-year-old Chrissy Brajcic, from Ontario, Canada, had an operation four years ago to treat urinary incontinence after the birth of her second child. She underwent a procedure that involved the use of a mesh implant called a mid-urethral sling to support her bladder. After the operation, she experienced severe pain and was left in a wheelchair. She eventually had the implant removed. Her pain continued, however, and she suffered recurrent infections. 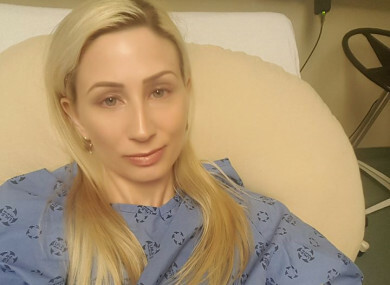 She launched a campaign to highlight her story and raise awareness of the problems suffered by other women who have undergone this procedure. The mother-of-two also featured had in a Canadian documentary about mesh implants earlier this year. In recent years there has been international scrutiny surrounding these devices, which are made from a type of plastic called polypropylene. However The Department of Health’s Chief Medical Officer is currently compiling a report on the use of transvaginal mesh implants in Ireland, after the stories of a number of Irish women who had these implants were highlighted. Chrissy Brajcic became resistant to antibiotics and was hospitalised in October this year suffering from sepsis. She died last Wednesday. Last week her husband Tony told CTV News that her heart had stopped. The coroner has not yet confirmed her cause of death and her family is awaiting the results of a toxicology examination. After my near death experience a few weeks ago with sepsis from drug resistant infections from surgical mesh, I feel now more than ever I need to advocate for the mesh injured. I will never stop fighting. Please share and raise awareness…this is a life or death issue. Tony Brajcic this week thanked all of the people who had supported his wife over the last four years. “It’s clear by all of your messages that Chrissy was truly a special woman and touched the lives of many people,” he said in a Facebook post on the campaign page. Email “Vaginal mesh campaigner dies in Canada after being hospitalised for sepsis”. Feedback on “Vaginal mesh campaigner dies in Canada after being hospitalised for sepsis”.